Create games while learning computer programming as well. 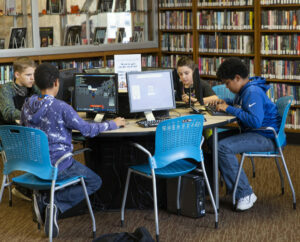 Starting at 4:30 p.m. Thursday, Feb. 7 and continuing weekly through March 28 at the downtown library, kids taking part in Coding Scratch will start using programming skills to make games and other projects. Scratch makes it easy to code and develop games and other projects. Start programming an extreme sports game of your very own quickly. Registration is expected to ensure enough computers are available for everyone. “We hope kids will be excited about this opportunity to learn about coding,” said Allison McLean, head of the library’s Young People’s Services. In addition to learning coding and exploring computer science, students will be able to learn more about how technology is used to make video and computer games. Those signing up do not need any prior computer experience but will need to know how to read. Ages 8 and up is perfect for this program.